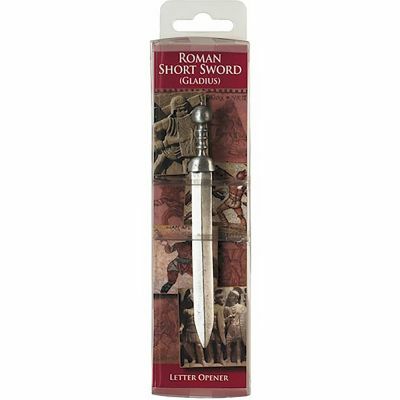 Patterns of Time Roman Short Sword Letter Opener, New Products! 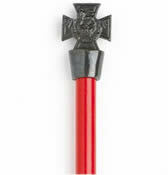 The Gladius was the primary sword of ancient Roman foot soldiers and was also used by Roman gladiators. The "classical" Roman short sword was a double-bladed weapon thought to be of Spanish origin. It had a blade between 50-60cm long and about 5cm wide. The blade was generally made of iron with the handle normally consisting of three pieces, a rounded hilt, a grip with four finger ridges and a bulbous pommel. This Roman short sword is made from pewter and packaged in a clear acetate box with an information card.